I still have five years to go before I am eligible for Medicare, but even then I’ll need a Medigap policy. Before the Affordable Care Act (ACA), I had a difficult time buying insurance. I ended up in North Carolina’s high-risk pool, which is going away at the end of 2013 because ACA policies will be available. If you have health insurance from your employer, as I used to, then none of these things has much impact on you personally. If you retire before you’re 65 and eligible for Medicare, it would have become an issue for you without ACA. Trying to find affordable private health insurance when you retire (voluntarily or involuntarily) in your sixties before the Affordable Care Act was a bear. 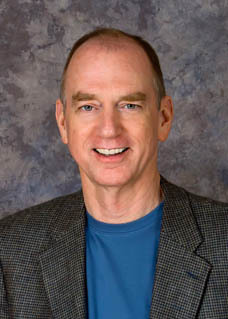 The enormous amount of money I have had to pay for healthcare has been the biggest financial surprise of my retirement. I knew it would be burdensome. I just wasn't prepared for this. Over the past eight years I have spent just shy of $18,000 a year for health insurance to cover my family and I can't recall that I ever met a deductible on my $5,000-deductible policies or that a claim was ever paid. In fairness, I was protected against catastrophic medical expenses all that time, had I been so unfortunate, so the premiums weren't for naught. I just spent a harrowing week trying to decide on a new ACA health insurance policy for my family and I’d like to share some of my findings. It seemed like an amazingly complex problem. I created a Space Shuttle Program-sized Excel spreadsheet, but was eventually able to narrow my choices to a handful. Two things made the process simpler, one good, one not so much. The good part is that ACA forces all insurers to cover essential services in every policy, so I didn’t have to read each one closely to see what was not covered and how and why the insurer could rescind my coverage or cancel my policy if I made a large claim. ACA weeded out the junk policies for me. Of course, being able to buy a policy at all with my pre-existing conditions helped. Prior to ACA, finding so many potential policies to consider that I needed a spreadsheet was never a problem. I was diagnosed with cancer in 2000, but Blue Cross Blue Shield of North Carolina (BCBSNC) claimed they refused to cover me because I took medication for a migraine headache one time back in the 1980’s. At least that’s what they wrote to me when I demanded an explanation. The bad thing that made my selection process simpler was a lack of insurance carriers in North Carolina. BCBSNC actually ended up with a larger monopoly than they had before ACA. I read recently that Kentucky now has 180 policies available at Kynect. Carolina has Blue Cross Blue Shield. I didn’t need HealthCare.gov. With one carrier in the state, you can just go straight to their website. A story in the Raleigh News and Observer reported that the competition left after the state refused to expand Medicaid. That apparently signaled insurers that there might be lots of poor people here who would otherwise be on Medicaid applying for policies and, since poor people are usually less healthy, we no longer fit into their profit plans. Ultimately, I found myself reviewing about a dozen or so policies, all from BCBSNC. My wife and two college-aged children each had separate pre-ACA policies from BCBSNC, since they refused to cover me. The kids’ policies were grandfathered under ACA; my wife’s was not. I spoke with an independent agent for BCBSNC about the grandfathered policies and she told me they were better than new policies. I should keep them and get a family policy to cover my wife and me. The main thing you should look for in a health insurance policy is not whether a $200 prescription will cost you the full price or a $25 copayment, but whether a major illness can bankrupt your family. Medical expenses are the leading cause of personal bankruptcy in the U.S. In insurance parlance, the most important factor is the “Out-of-Pocket Maximum” (which I will call OOP Max for short), or the most you will ever owe in any one year of the policy. 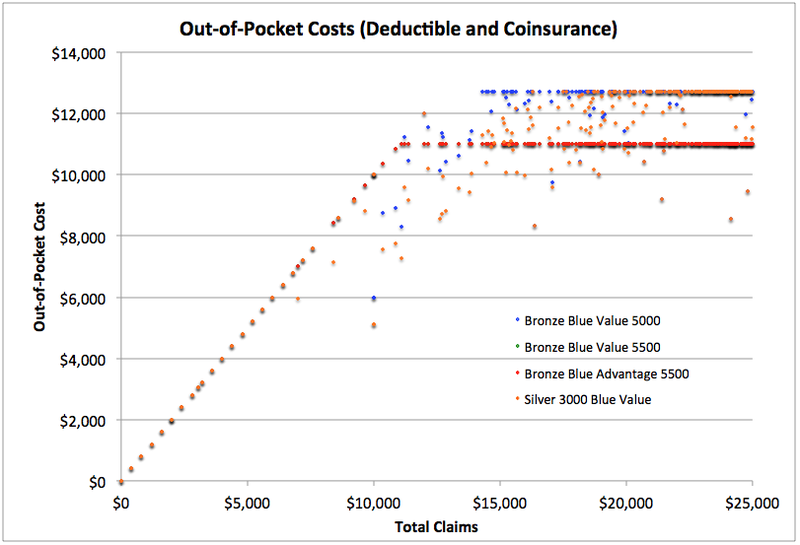 Most policies describe OOP Max as the sum of your deductibles, copays, and coinsurance. I don’t know about you, but premiums also come out of my pocket, so I include them in the OOP Max. When I looked at the agent’s advice, insuring with three policies instead of one by keeping the grandfathered kids’ policies, the OOP Max became a problem. Each policy has its own OOP Max. A single family policy’s OOP Max added to the OOP Max’s for two more individual policies quickly becomes a very large number (near $40,000 in our case). The family policies covering all four of us topped out at around $30,000. I rejected the agent’s suggestion and vastly simplified the selection process by deciding we would best be covered in the worst-case scenario by a single family policy. 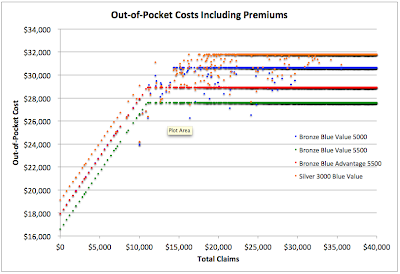 Costs would be about the same under all four policies for claims totalling up to about $10,000, but for larger claims, the OOP Max begins to kick in. Two of the policies limit OOP costs to $11,000 and two limit them to $12,700. Without premiums included, it looks like the four policies have only one of these two OOP Max levels. Notice I am using the insurance carrier’s definition for OOP Max. Now, see what happens when I use my definition, which includes premiums. As you can see from the graph above, the policies have four distinct maximum annual costs when their premiums are included. Also, it becomes more obvious that the true out-of-pocket maximums you might have to pay range from $27,608 to $38,616. Those are the worst-case scenarios you need to plan for, not the $11,000 to $12,700 range in the first chart that ignores premiums. By the way, more expensive “Silver” and “Gold” policies don’t lower your OOP Max and give you more protection against bankruptcy. They do get you more doctor visits and lower cost prescriptions, but they have higher premiums. While it might feel good to pay a $25 copay for that $200 prescription or visit your doctor with no copay, saving several hundred dollars a year on premiums ultimately feels better. Another question I needed to answer was whether to pay BCBSNC more money for access to their larger network of doctors. All of our doctors but one are available in the Limited plan and the Large Network plan costs about $1,300 more per year. You can pay for a lot of out-of network doctor visits with $1,300 a year, so I decided on the Limited network to lower premiums. The next choice I needed to make was whether to pay a larger premium for a lower deductible. As I mentioned, over the past eight years we have never had a claim paid. In most years, then, we pay large premiums and get only negotiated doctor rates and catastrophic-risk protection in return. 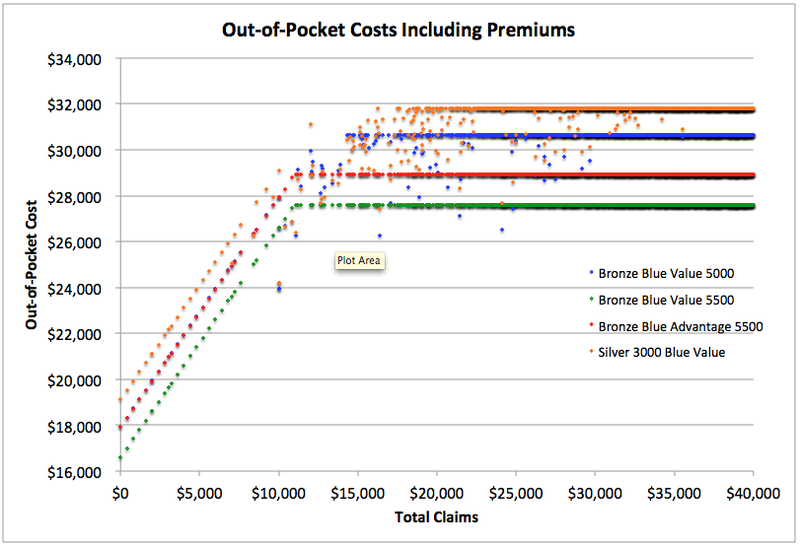 Smaller premiums are better if there are only small claims, of course. 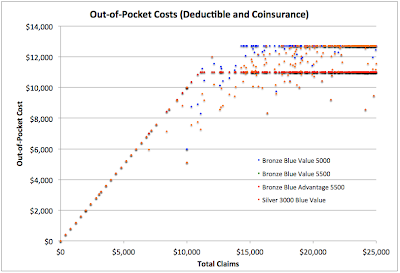 My decision was to select the highest possible deductible policy ($5,500) with the lowest premiums and that made me realize that I could have come to the same conclusion with a much simpler analysis. The more you self-insure, through higher deductibles and higher coinsurance, the lower your insurance policy costs. That’s obvious, of course, since you’re buying less insurance. So, the highest deductible and highest co-insurance policies will be cheapest. The most important factor in selecting a policy is making sure that the Out-of-Pocket Maximum won’t bankrupt you. More expensive policies lower cost when your claims are low, but they don’t make much difference when claims are extremely high. You have to make a purchase decision on doctor network access, but if you expect only a reasonable number of out-of-network visits to a particular doctor, the cost savings on your premiums may save you more than your out-of-pocket costs. To select a policy, you have to decide what is important to you. Is it more important that you not pay a doctor $150 instead of a $25 co-pay, or that your total costs for the year is hundreds of dollars lower? What is the worst-case annual medical cost you can tolerate? Is it important that every doctor you see be “in-network”, or would you rather pay extra for a few out-of-network visits if your total annual costs were lower? Had I thought through these basic issues, I suspect my analysis would have been much simpler than I made it, and I would’ve ended up with the same decision. I would have selected the lowest total cost (including premiums) policy, not with the highest deductible I could afford each year, but with the highest Out-of-Pocket Maximum I could handle in the worst imaginable year. Focus on total costs for the year including premiums, not individual costs for an office visit or a prescription. I think a lot of people search for a policy like an all-you-can eat buffet. They want to make sure any doctor they might wish to see is in-network, and prescriptions and office visits never cost more than $30. That's an expensive way to buy health insurance, retired or not. *To calculate the break-even in years, divide the additional OOP Max from the second policy by the increase in premiums. Often, you will find that an increase in premiums provides no increase in OOP Max and you will never be better off (from an OOP Max perspective) to pay the higher premium. For example, if paying an additional $1,000 a year for a policy with an OOP Max that is $2,000 lower, you would need to have large claims at least every two years to justify the higher premiums from an OOP Max perspective. Of course, the additional premium might provide other benefits. How did you generate the OOP cost for a given claim amount (for a given plan)? I'd like to make a similar graph for my own employer-provided health care options, but the OOP cost depends on the claim makeup (included but not limited to preventative care, prescriptions, hospital stays, specialist doctors visits, and non-specialist doctors visits). Your plan is a bit more complicated than mine were. It really gets complicated when you have more than one insured on a plan, because the deductibles are often split among individuals. But, it sounds like you might be the only one on your plan. I can offer a couple of suggestions. One is the way I started, by generating thousands of scenarios, randomizing all variables like Rx, OV's, specialists, etc., and plotting the results. (That's why my graphs have data points that don't perfectly fit on straight lines.) This can be done with Excel, but it was much easier to generate the data on a tool like Mathematica. I ultimately found that I could make decisions based on just three or four scenarios, instead, as I explained in the post. Definitely use a scenario with almost no claims and one with very high claims. Then maybe one halfway between the deductible and the OOP Max. Maybe a best case and worst-case copay scenario. I suspect you will find that copays are not a significant factor compared to premiums, deductibles and OOP max and spending a lot of effort on evaluating them won't help a lot. But I could be wrong. Let me know!